The first step in determining if a sound source might impact marine animals is to make an estimate of the sound field around the source. A source’s sound field is the level of sound at different distances and depths as the sound travels away from the source. There are many models that predict how sound travels away from sources. Several factors are included in these models. The geographic location and time of year that the source will be used affects how sound travels through the water. Water depth also affects how sound travels. Sound energy will be lost through the sea surface and into the sea floor, particularly when sound travels in shallow water. The depth and any movement of the source will also affect the sound field. Finally, the characteristics of the sounds that are transmitted are important. This includes the intensity and duration of the sounds, their frequency, and the number of sounds and the rate that are transmitted. If we think of a wave spreading out from a rock that is thrown into a pond, the further from the source, the bigger the circle formed by the wave. As the circle gets bigger, its total length (circumference) also gets bigger. Spreading loss occurs because the total amount of energy in a wave remains the same as it spreads out from a source. (We are neglecting sound absorption for the moment.) When the circle of a surface wave gets bigger the energy spreads to fill it. Therefore, the energy per unit length of the wave must get smaller. The height of the surface wave (amplitude) decreases as the energy per unit length of the wave crest gets smaller. 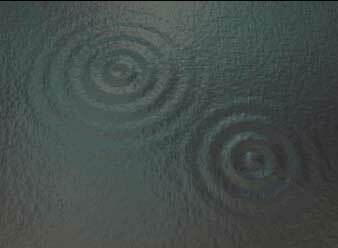 As surface waves spread out on the surface of a body of water, such as a pond or ocean surface, the amplitude gets smaller rapidly. This is called cylindrical spreading. Waves that spread out in all directions from a sound source, such as one in the middle of the ocean, get smaller even more rapidly than surface waves spreading out horizontally on a pond or ocean surface. This is called spherical spreading. The following table compares the relative intensity and amplitude of sound waves at one meter from the source to their values at greater distances for cylindrical and spherical spreading. The intensity and amplitude decrease very rapidly for waves spreading out in all directions from a source at mid-depth in the ocean. Sound cannot propagate uniformly in all directions from a source in the ocean forever. Beyond some range the sound will hit the sea surface or sea floor, and the spreading will become approximately cylindrical. Sound levels also decrease with distance due to absorption. As sound travels through a medium such as water, it gets absorbed – caught by the molecules within the medium. The medium actually changes some of the acoustic energy of the sound wave into heat. One way that this happens is that the acoustic energy of the sound causes the molecules of the medium to start vibrating. The molecules are at rest before the sound wave comes through. In order for them to start vibrating, the sound must be powerful enough to overcome the molecule’s resistance to movement. The molecules must overcome the viscosity of the medium through which the sound is propagating. They do this by stealing some of the energy from the sound wave. The absorption in sea water is much greater than would be expected due to the viscosity of pure water. In addition to the absorption due to viscosity, some of the chemicals that make the ocean salty also absorb sound and convert it to heat. The final result of absorption is that as sound travels or propagates through a medium, its amplitude decreases faster than it would due to spreading loss alone. This is due to the loss of acoustic energy to heat.